Readers of this blog will know that I’m 100 percent focused on eczema, so why this post on Allergy and to tackle Myths! I came across an article ‘Eight Myths from the Food Allergy Clinic’ written by St Thomas Hospital and Kings College Hospital, London, UK and got very interested because I do think these myths are very common! My detective side got the better of me and I did a research and found many more – but I’m just highlighting to you those more applicable for parents with eczema children, so here you go! In reality: Should the wheal exceeds a certain size (usually 3-4 millimeter), then it can be considered as a positive reaction to the allergen. BUT a larger size wheal does not mean in reality, the child will show a more severe reaction versus another with a smaller wheal. In reality: As the conditions that were present in a previous allergic reaction would defer from the future one, parents should not assume that a child will react in the same way to the allergen every time. Factors include the amount, state (raw versus cooked), existing health conditions at the time of allergic reaction. Parents should however note that should a child had a previous anaphylactic reaction, the likelihood of the same allergen triggering a severe allergic reaction is more likely. In reality: No conclusive study on this, and the American Academy of Pediatrics had withdrawn its advice on avoidance of peanuts, eggs, cow’s milk and fish during pregnancy and lactation. In reality: MMR vaccine is safe for children with egg allergy, see below from a previous Dr Q&A Dr Liew: Vaccines are the one of the proven public health measures to reduce mortality from infectious diseases. Vaccines are produced for significant infectious diseases. There is no link between vaccination and allergies. Traces of egg proteins can be found in influenza vaccines and specialised vaccines like yellow fever. Egg allergic patients should discuss the risk benefit ratios of receiving these vaccines. MMR vaccines are safe for egg allergic patients. In reality: Some proteins that trigger an allergic reaction are not destroyed by cooking, see AAAAI’s recommendation on this: Most food allergens can cause reactions even after they are cooked or have undergone digestion in the intestines. There are some exceptions. For example, some allergens (usually fruits and vegetables) cause allergic reactions only if eaten in their raw form. I actually thought of including a 6th myth, which is children with parents who have allergy are more likely to develop the same allergy to that specific allergen. Generally, children are more likely to have allergies if their parents have, but whether the allergy to a specific food is inherited is still pretty controversial. Found a study that showed male teens were more likely to be sensitized to dog if their fathers are, so this myth may not be a myth after all. Anyone has any thoughts? Myth: That most children will outgrow their allergy by age 5yrs. Sadly not true, if anything the allergy rates are rapidly growing in the developed world. Myth: That you only develop allergies in childhood & early teens. Most definitely not true, even the elderly can develop anaphylaxis to something they have consumed throughout their lives without incident. Here’s a myth we hear a lot: antibacterial hand sanitizer is the best for getting rid of peanut or nut residue. In reality: A Johns Hopkins study showed soap & water or wipes were best for getting peanut off hands. Anitbact. sanitizers left residue. Myth: Children with food allergies were raised in too “clean” an environment. Reality: This way of thinking is a misinterpretation of the “hygiene hypothesis”. I can assure you that my house was plenty dusty, and my daughter still developed food allergies. 😉 Having my daughter play in the dirt would not have prevented her food allergies, as she was sensitized pretty much from birth. I do know a few parents whose children have reacted with eczema or alleriges after receiveing the flu and MMR vaccine. I have one to add…. 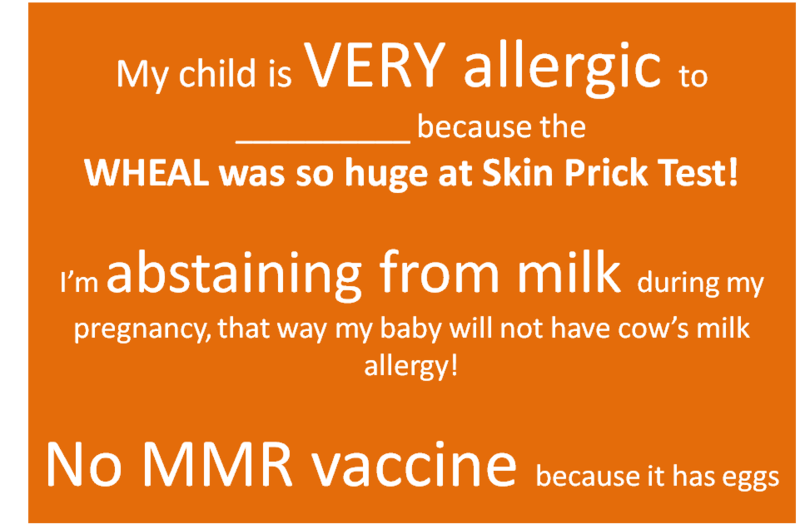 My child tested negative, so he or she is not allergic or intolerant to anything. In reality: Skin and blood allergy tests are notorious for their false positive AND false negative results. The only real way to know if your child is allergic or intolerant is to do a food challenge with a physician. Thanks Jennifer for dropping by! My girl did have fever after (forgot which) vaccine, and fever is a trigger for eczema flare-ups. I’m also under the impression that it is more common to test more items in US than in Singapore, where here, doctors usually choose the most common ones. You think? My girl tested for maybe 6-8 items. Great post Marciemom! Life with eczema, allergies and asthma is difficult enough without the myths. Thanks for helping get the truth out! Thanks for dropping by Doc!